One way to bring some joy to our hearts during the dreary days of winter is to remember the bright and cheerful colours, with which the wild flowers bedecked the landscape during spring, summer and fall. It is my hope that you will like the small sample of roses, daisies, tiger lilies and other floral beauties whose names I do not even know. I would also like to take this opportunity to thank all my followers for their past comments and likes for my blog and to wish each and everyone a very Blessed Christmas! Above the Nakusp Hot Springs leads a trail to the bridge over the Kuskanax Creek. Its crisp and clean mountain waters tumble down and join the Arrow Lake at the picturesque town of Nakusp. Let’s take walk there and enjoy the amazing scenery. For information on the author search for Bill Laux on this blog or click here. From the days of the Hudson’s Bay Company fur traders, the established routes into the Kootenay country in British Columbia had been up the river valleys from the Washington Territory. Six north – south mountain ranges made entry from east or west extremely difficult and impossible in winter. The first prospectors came north from Walla Walla and Colville. They followed the Indian and Hudson’s Bay Company trails on foot or ascended the rivers in boats. There was a good Hudson’s Bay Company trail running up the Okanagan Valley from Fort Okanagan to Kamloops. Prospectors could leave this trail at Osoyoos and bear east to get into the Rock Creek placer grounds. There also existed an Indian trail running north from Spokane Falls to present Sandpoint and Bonner’s Ferry to the Moyie River. This river would be followed on the Indian trail to reach the placer grounds at Wild Horse Creek in the shadow of the Rockies. 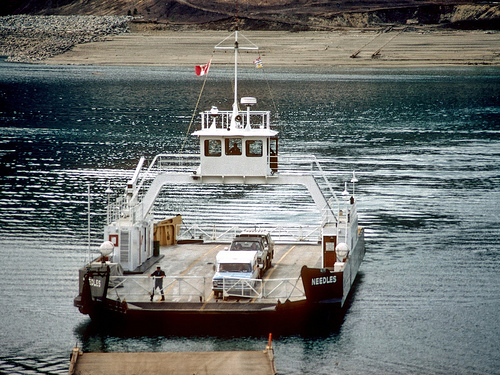 The Columbia River was the third and easiest route. From 1865 until 1874 when it was laid up, the small sternwheel steamer, Forty Nine, based at Little Dalles, could be hired to carry parties of miners up the Columbia into Canada. The Victoria, B.C. 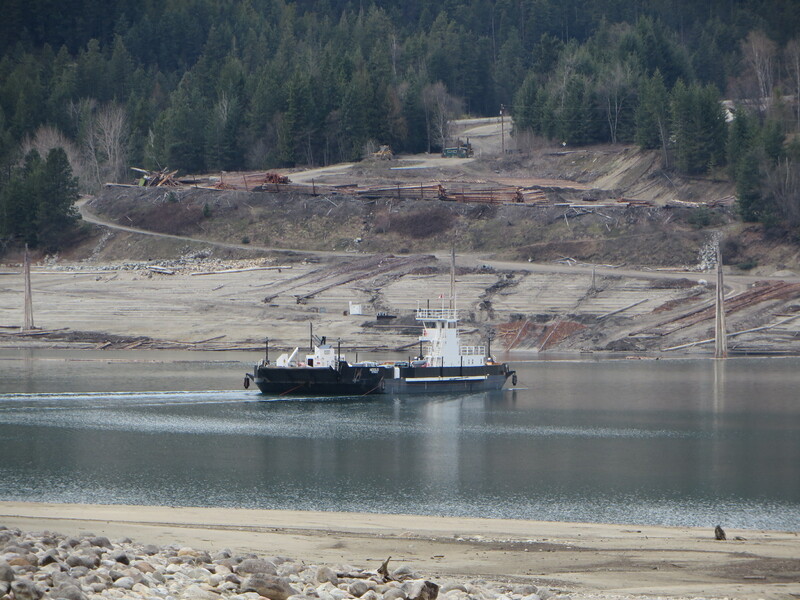 merchants, frustrated at seeing the Kootenay trade all going to the Americans, lobbied their legislature for a trail to connect the Kootenay mines with the Coast. $80,000 was appropriated in 1865, and Edgar Dewdney was given the contract to build the trail, four feet wide and 400 miles long, from Hope, on the Fraser River, to Wild Horse Creek on the Upper Kootenay. Much is made of the construction of this trail in B. C. histories as the first communication between the Coast and the Kootenays. However, the stretch between Hope on the Fraser and Fort Shepherd on the Columbia was a mere brushing out and improvement with rock walls and bridges of the old HBC fur brigade trail, over which the HBC sent out their furs (and the first placer gold in 1854) to New Westminster. The sole section of the trail which was new, and not an existing trail improvement, was the 50 mile portion between the Columbia at Ft. Shepherd and the Kootenay near Ockonook. From that point the trail followed the old Wild Horse Trail of 1863. In 1887, a pair of prospectors, George Leyson and George Bowerman, traveling the Dewdney Trail, found silver bearing quartz at the divide between Little Sheep Creek and Trail Creek, just two miles north of the border. They staked the Lily May claim and took out some tons of ore. Lacking any means of getting it to the Columbia, they left it there on the dump until such time as the Dewdney Trail should be improved to a wagon road. The Lily May claim lapsed, but it was re-staked by Newlin Hoover and Oliver Bordeaux of Colville in 1889. D.C. Corbin was building his Spokane Falls and Northern Railway through Colville to the Columbia that year, and with the arrival of rail transportation, lapsed mining claims like the Lily May were now of interest. Oliver Bordeaux recruited Joe Moris, another French-Canadian prospector wintering in Colville, to go with him in March of 1890 to do the assessment work on the Lily May. When the work was done, Moris joined with Joe Bourgeois, who had come up Trail Creek to examine the strange, red rock mountain some five miles north of the Lily May. [ii] On that mountain the two men discovered a continuous ledge of strongly mineralized ground and located five claims along it. In Nelson the assays of their samples proved so disappointing that they were unwilling to pay the $12.50 fee per claim to record their finds. Instead, they traded their fifth claim, the Le Roi, to Colonel Topping, the Deputy Mining recorder in exchange for his paying the recording fees on the four claims they kept. [iii] Nelson was an American town at this time, and Colonel Topping, an American writer and prospector, was its unofficial postmaster, selling only American stamps. So isolated was the Kootenay from the rest of British Columbia that there was no Canadian mail service. Nelson mail went out by boat to Bonner’s Ferry, to the Northern Pacific at Kootenai Station, and on its trains to American and Canadian addresses. Moris and Bourgeois returned to Red Mountain, followed by Colonel Topping and others, to dig on these new finds. As they went deeper into the veins the assays of the ore improved spectacularly. The news got out at once. A rush began, largely of Americans from Colville and Spokane Falls. Colonel Topping preempted a townsite at the mouth of Trail Creek, sure that a city would arise there if the mines proved out. 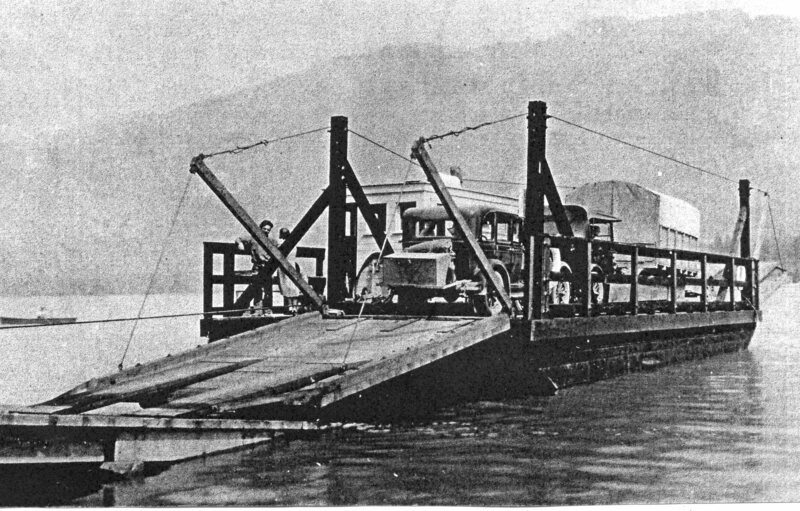 The twice weekly sternwheel steamer service between Dan Corbin’s SF&N railroad at Little Dalles and the Canadian Pacific at Revelstoke was bringing miners, prospectors and merchants with every trip, from all over the Northwest, and Topping’s tiny Trail Creek Landing began to grow. The ore Bourgeois, Moris, Colonel Topping, and others were hauling to the surface on Red Mountain was copper, with gold and silver. Although their best ore contained $300 to $400 in gold for every ton, it could not be milled on the site. Copper ores had to be shipped to a smelter to extract the metals, and the nearest copper smelters were in Montana, 700 miles away. From the mines themselves, 2300 feet above the Columbia, there was only that four foot wide Dewdney Trail winding down Trail Creek Gulch to the river. Sacking the ore and sending it down on horseback was prohibitively expensive. Winter rawhiding was the preferred means of transport. A horse could carry but 400 pounds on its back, but if the sacked ore were wrapped in a green cowhide, hair side out, a horse could easily pull 1500 pounds down a snow covered trail. The best ore was rawhided down the mountain that first winter of 1890-91, and stockpiled on the riverbank to await the opening of navigation in the spring. The Upper Columbia was closed by ice every winter; steamer schedules could be maintained only from Mid-May to December. Upriver from the Trail townsite, the Canadian Pacific was building Captain Ainsworth’s isolated portage railway around the falls and rapids of the Kootenay River so that Columbia River steamers could connect with Kootenay Lake steamers. The Columbia and Kootenay Railway was put into service in 1891, and ores from the Kootenay lake mines, the Silver King mine above Nelson, and the gold mines of Forty Nine Creek could now be put aboard the steamer, Lytton, at Sproat’s Landing. The Lytton took them down river to the US. and D. C. Corbin’s rails at Little Dalles. The SF&N and Northern Pacific forwarded them to the smelters in Idaho and Montana. It was as Captain Ainsworth had foreseen ten years before: the compelling topography of interior British Columbia made the Kootenays a logical extension of American commerce with Spokane as its supply and financial center. In his Trail townsite, Colonel Topping needed money to clear streets of tree stumps, to install a water system, and to put some sort of bridge or causeway across the delta of Trail Creek which flooded his proposed business district every spring. For funds he would have to put up a part of his Le Roi mine. In the fall of 1890, he took some samples of his best ore, and booked passage down river to Little Dalles where he boarded the train for Spokane. On board he met two Spokane lawyers, George Forster, and Colonel William. H. Ridpath. He showed them his samples and described his mine. The men were impressed. In Spokane they introduced him to some investors, including Judge George Turner, Colonel W. W. Turner and Colonel Isaac N. Peyton. These men were all investors in mining properties in Eastern Washington and northern Idaho. Peyton, Ridpath, George Forester and Judge George Turner were at that time partners in the Dead Medicine silver mine north of Colville. The Dead Medicine had ceased paying dividends after the silver price crash of 1893 and the impoverished syndicate was looking for a paying gold proposition. Judge George Turner was a well known personality in Stevens County. He had come west from Missouri in 1884 and the next year was appointed Teritorial Judge by President Grant the next year. He held court in Colville until 1888 and later became a U.S. Senator. Colonel Topping now laid out and cleared the streets of his townsite, put in a water system,and began a brisk sale of lots. His town began to fill with people drawn by the success of the mines on Red Mountain. Up on that mountain, Ross Thompson had some of the steep ground surveyed and platted another townsite he called Rossland. It too, attracted buyers, as good ore was struck in the Centre Star, the War Eagle and other mines. Still, isolation was hampering the development of the full potential of the Red Mountain mines. Only the highest grade ore would bear the cost of rawhiding down to the Columbia over the snow covered trails, and the costly manhandling of the sacked ore onto the steamer, and then onto the freight cars at Little Dalles. Most of the ore being hoisted from the mines was not rich enough to support the cost of this pioneer transportation. It was stockpiled at the mines, huge dumps of it, worth $20 to $30 a ton at a smelter, but 2300 feet up on a remote mountainside, worthless. Trail and Rossland desperately needed a railroad for cheap, year round transportation. If one were not forthcoming, the spectacularly rich fraction of Red Mountain ore would be quickly exhausted, and the camp, like so many others in the West, would shrivel and die.